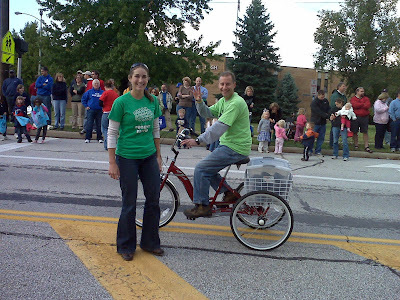 Century Cycles owner Scott Cowan was in the Bay Homecoming parade yesterday, riding along with BHS teacher Erin Whistler (left) and her Project Earth students. They threw out 100 t-shirts to the crowd lining the parade route -- hence Scott's decision to ride an adult trike with a basket to hold 100 t-shirts! Project Earth is the student environmental group that helps us organize Bay Bike To School Challenge sponsored by Century Cycles and Chipotle. Planning is already underway for the 2010 Bike To School Challenge, scheduled for May 3-21!